"At Alexandria on 26 March 1941, with the rear party of 23 NZ Battalion, I embarked on the Greek ship Ionia. She was crowded with odds and sods from various units, some from 21 Battalion. The troops’ quarters were unspeakably dirty and overcrowded; the cabins shared by four to six officers were not much better. The floors were awash with bilge and the seas flooded in through faulty portholes. At least, though, we were able to see the Aegean, as well as sleep in it. And we were going towards action: though I, for one, had little confidence in the outcome. . .
. . . On the second day out, an Italian aircraft flew overhead and, to the disgust of the Greek Captain, (‘only an Italian aeroplane’), we were all ordered into life belts and put on boat drill. The solitary and token torpedo dropped was a wide miss. As we dispersed, I saw a tall lance-corporal in horn-rimmed glasses in animated conversation with a sailor in obviously fluent Modern Greek. I at once realised this could only be Paddy Costello." 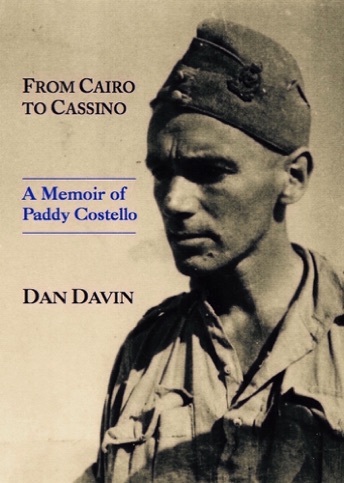 In From Cairo to Cassino Dan Davin writes of the wartime days of his friendship with the extraordinary Paddy Costello. Paddy Costello, along with John Mulgan, Geoffrey Cox, Ian Milner, James Bertram, and Dan Davin, was one of a cast of young scholars who made seemingly peripheral yet lasting contributions to the New Zealand post-war cultural landscape. But Costello, despite his great many gifts, never quite found his place in the world and he remains an elusive and contradictory figure, someone whose reputation rests on what he could have done rather than on what he did. Yet he continues to fascinate by his very elusiveness. Paddy Costello was also the best friend of Dan Davin: expatriate publisher, editor, novelist, short-story writer, poet, raconteur, and not least of all an indefatigably generous host and friend to many New Zealand writers. From Cairo to Cassino recounts the beginnings and the deepening of their friendship as they talked, tippled and fought their way through North Africa and Italy. Spanning Davin’s embarkation with 2 New Zealand Division at Alexandria, as it headed towards its mauling in Greece and on Crete, through to the day of the bombing of Monte Cassino, this book is many things: gentle and impassioned, candid and ironical, recondite and visceral. It is also often very funny. One of Davin’s last significant works and perhaps the one in which he made his deepest personal investment, From Cairo to Cassino confirms that he was one of our finest memoirists, as he lovingly brings Costello back to life in all his sound and fury. A significant addition to New Zealand’s literature of the Second World War, this is a special book that deserves to be read and reread. While it has been quoted from in biographies of Davin and Costello, this is the first publication of the full text.